Sterling Silver 18 inch, 1.5mm Diamond Cut Disco Bead Chain Necklace with Spring Ring. Sparkly! 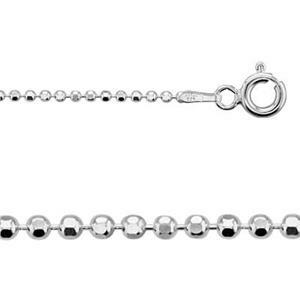 Diamond cuts add some sparkle to our classic bead chain. A great foundaiton for your favorite charms and pendants, this 18 inch diamond cut bead chain necklace is a great length for layering or wearing alone. These are perfect for pendants if you want to add some sparkle. Box chains are great, but this brings the look up a notch!! My only critique (for all chains) is that I prefer lobster claw clasps. But for the money you can't beat this!